Christiane Charette on Radio-Canada's Première chaîne has a piece on hipsters and hipsterism... lol The comments by listeners taking the "phenomenon" seriously are priceless. Since getting my new glasses this morning, everything seems clearer. I've been wearing scratched up glasses for at least the past month. I presume that something went awry after wiping my previous pair with the edge of my t-shirt when I was in Beijing, perhaps with sand sticking on it. It's covered by the company's insurance, so it's all good. 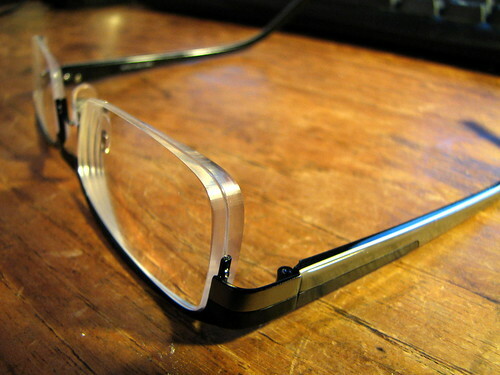 The frame is rimless below the lenses and the sides are in plastic. Everything is sharper now. My pictures even look more beautiful than I thought! 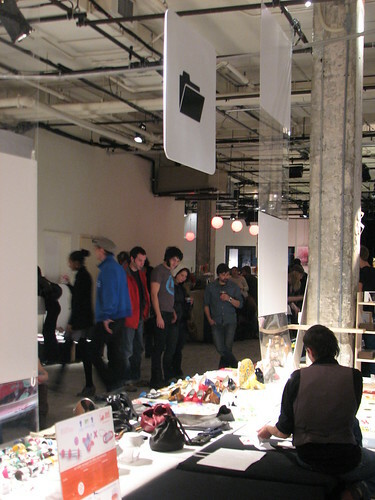 Le Souk à la Société des Arts Technologiques de Montréal. My parents just came back from China. This was my belly, and a t-shirt from the UniQlo Creative Award 2007 (intense Flash alert) collection. All that I can say is that for the equivalent of $15-20 in Canadian dollars worth of t-shirt, it'd be my ruin if I were to live in Asia. But then, I don't, so I am safe. Among those listed, my mother picked (indeed) Kiyotake Ogawa's "pattern". I thought that the World one (with Antarctica on the back), the Lazio Street and the Pigeons and Man are probably the other best ones. Makes me think that I could use a Japanese militaristic era top hat, and the suit that goes with it. With all the stuff it implicates. MacArthur, Hirohito, MacArthur, and Hirohito again. Upon closer inspection, we take note that those are concatenated egg tart images and also contain a semi-hidden "I Love Egg Tarts ^o^ RT" message across the design. 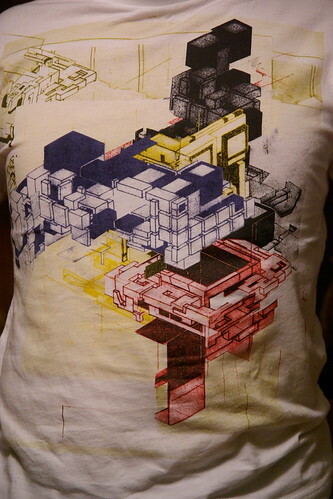 XD Third prize of the current local UniQlo design contest (1st and 2nd were sold out, apparently). She also bought a new digital baby for myself and father to share, a Canon S3 IS. We'll need to baptise it. I'm the type of person who saves on lunch money ($1.25 for right-enough tomato pizza), but then goes on to blow it all on some big relatively unnecessary spending ($90 on headphones - which I acknowledged to buy before entering the shop... I don't know if it was a good sign the salesperson reduced the price by $10 despite that I was basically sold?). I also spent 80-something on the books aforementioned, one of which is available online, for free, through my channels. So yeah, my brother came back from Asia, and with him, a few tees from UniQlo. They are quite... interesting. Japanese-language print, and upon checking the stuff up on the web (one of the two actually had a website address inscribed on them), I found out it probably came from a collection of tees with ancient corporate logos. Yeah, they are logos and design from old companies, a fishing bait one, and a rice vinegar one. Not only should I try to find myself a hat (with the salary that arrived in my bank account, it should help), but I should also try to find myself a tuque, for this upcoming event. Hot wine is a concept I've had knowledge of before, but not something I've experienced. What a non-category to open... I just thought that I would want to have, not a dark gray detective hat with a long trenchcoat, but rather, a beige hat with a blue stripe to go with a beige or light-coloured suit, and a simple white sleeve shirt. It would look good on a sunny end-of-afternoon Sunday in Miami, or maybe just with Amai Seikatsu playing in the background? 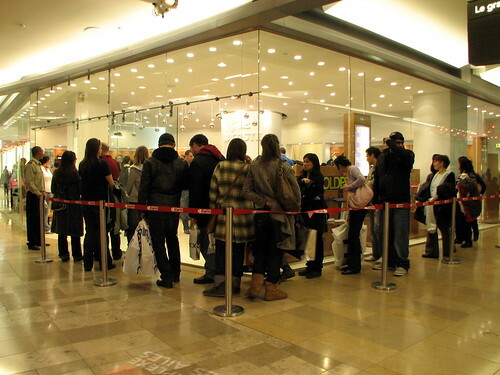 This page is a archive of recent entries in the Fashion category. Fantasia is the previous category. Food is the next category.